The sun had begun its long fall across the western sky, destined to cross that stark threshold of color where sapphire blue meets the autumnal yellow tree tops that rise out of rough hewn grass and brown clay upon which is built the worn red tiled roofs of Gumiel de Mercado, this tiny town of not 400 that we've come to in our journey across Spain's Ribera del Duero. This feels the most ancient and the most rustic of the winemaking towns we've yet seen, the perfect juxtaposition with Bodegas Arrocal, a winery where several generations work side by side embracing modern technique to produce stunning Old World wine. Bodegas Arrocal is imported in the United States by Grapes of Spain, available in the Washington, DC area through The Vineyard of McLean (1445 Laughlin Ave, McLean, VA), in New York at Penn Wine and Spirits in Penn Station, and (we believe) in the Boston area through Blanchard's in West Roxbury, Jamaica Plain, Revere, Marshfield, and Hyannis. 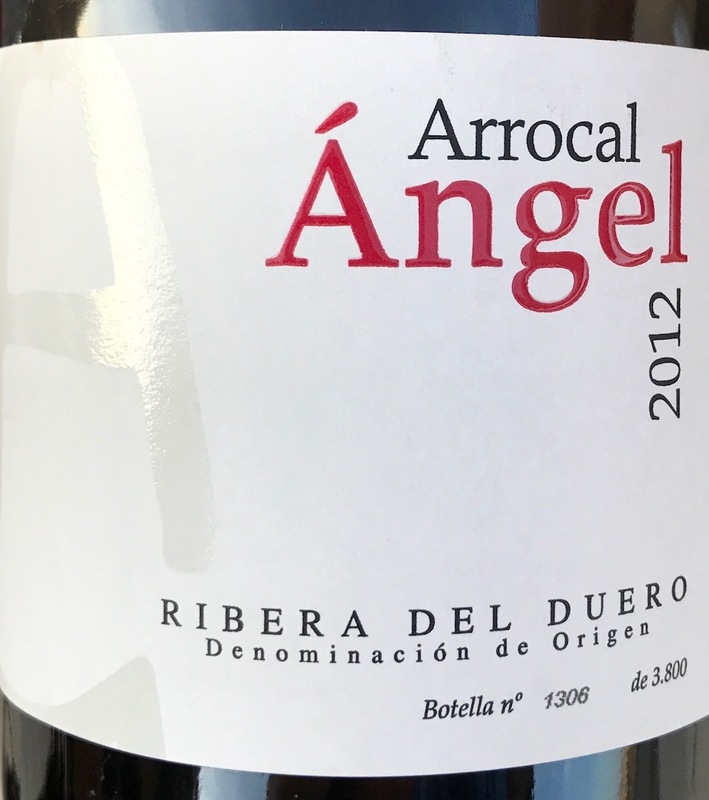 Show this post at The Vineyard of McLean for 10% bottles from Bodegas Arrocal. Grapes of Spain's website offers complete distributor information across the United States. Situated in north-central Spain, about two hours by car due north of Madrid, the Denominación de Origen (DO) of Ribera del Duero takes the name of the same river that from here winds its way westward south of Valladolid, through the wine regions of Rueda and Toro -- where we had just the day before visited the bodegas San Román and Elias Mora -- and, on crossing the border with Portugal flows through the Douro Valley where we later found the Quevedo and Quinta do Pôpa wineries. Thus, just 80 kilometers (50 miles) from Bodegas Arrocal originates the river along whose banks some of the world's finest wines are made. One of the last of Spain's regions to harvest grapes each year, Ribera del Duero is both dry and climatically volatile, hot in the summer and strikingly cold in the winter, with twenty degree (C) temperature differences between day and night. Red and white varietals grow here, but like neighboring Toro and Rioja, Ribera is known for its Tempranillo. Arrocal itself is a study in contrasts, a small production winery in a terrifically old town where the winemakers revel in experimenting with new techniques to produce their classic varietal red. The hillside above the town takes its character from the wine cellars dug by generations centuries-past, yet here in the winery we are surrounded by towering tanks where thousands of kilograms worth of grapes carry on their years-long journey from vine to table. Our host, Rodrigo, has directed water showers over the tanks to control the temperature as the recently harvested juice ferments. The juice from each vineyard is kept separate in individual tanks to control and measure quality. They'll soon transfer the young wine to 80% French and 20% American oak barrels, of which each is used for five years before being sold for whisky and sherry production. The circle continues. We've walked out into the waning afternoon, glasses in hand contain juice from the recent harvest -- 25 days in 2016 as opposed to the usual 15 -- I swirl it and look out at the town. Moments later we are leaning against the front of the of the bodega, an open bottle of Arrocal's signature Ángel shared amongst the three of us. The neighbor's dog sleeps peacefully in the gravel road just meters away. It's quiet here, peaceful, rustic. Of all the wineries we've seen, this is the one at which we have most deeply reconnected with the source. Like the first turns of the Duero, this -- it feels -- is where it all begins. 2011: The immediate prior vintage of the same wine we drank with Rodrigo on the steps of the bodega as the sun went down, we found the 2011 Ángel on the wine list at the excellent new Joselito Spanish restaurant Washington, DC. A mix of blueberry jam and bright red stone fruit with a little rough and tumble rusticity make for a highly dynamic nose. There's also a dusting of dark chocolate that turns into a harder cacao on the palate. It's cool and juicy, like biting into the juiciest piece of fruit. It curiously mellows while taking on additional structure once opened for thirty minutes. Beautiful balance of rusticity, jamminess, and blueberry accents make this a classic Ribera del Duero that we'd recognize as such in a blind tasting. 2012: This is the wine we drank watching the sunset over the vineyard outside at the winery. All Tempranillo, it was filtered before being aged twenty months in new French oak with malolactic fermentation occurring in barrel. There is nothing purple about this wine... it's all red, cranberry notes and coloring from start to finish. Offering great structure and smooth tannins, it was somewhere between the glass and the sun setting overhead that we fell in love with this place. Rodrigo kindly sent us on our way with this quintessential example of Ribera del Duero that we drank in a quiet moment several nights later on the balcony of our room in the old historic part of Seville. He recommended we decant, though our lack of gear at the time prevented us from doing so. That didn’t stop us from enjoying lots of blueberry in the nose with a little hickory wood that adds depth and character to the fruit of this 100% Tempranillo varietal wine. Vanilla pipe smoke that begins in the back of the nose continues into the palate where it mingles with notes of white tea, freshly picked black raspberry, and the blueberry that is so characteristic of Tempranillo from Ribera del Duero.